I'm fascinated by capturing an image of a person. Each face is wonderful and oh-so-hard to get right! 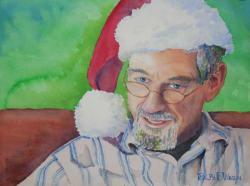 Watercolor: Jim on Christmas Morning, 14.5" x 10.5"
"Jim on Christmas Morning." A portrait taken from a 2009 photo of my brother-in-law James McCrea, still in his pajamas on Christmas morning. Watercolor, 14.5" x 10.5". From a June 2012 photo of Jean in her garden, wearing her characteristic well-worn straw hat. 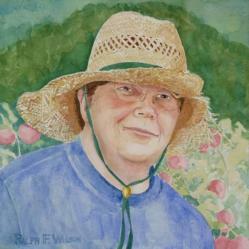 She loves planting and harvesting tomatoes, peppers, eggplant, and squash, plus fruit of all varieties. Finished Dec 2013. Watercolor on 140# Arches hot press paper, 10.5" x 10.5". Not for sale. One morning on a trip to the coast, I stopped by the Bovine Bakery in Pt. Reyes Station. 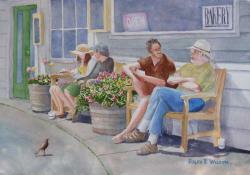 People were sitting at the teak benches out in front and chatting in the morning sun. But I was struck by the patient bird waiting for crumbs. Watercolor, 20" x 14". 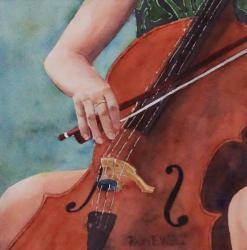 Exhibited at the juried Placer Art League Open Show at the Lincoln Art Center, July 2 thru Aug 2, 2014. Exhibited in the juried WASH "Go with the Flow" Open Show at the Sacramento Fine Arts Center, September 2014. I got this idea while watching a praise music video. What fascinates me is the hands and evident sincerity of the people. Watercolor. 20" x 14". 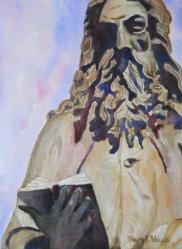 Watercolor: Pastor Curtis - 12.5 x 10.5 in. My friend is the pastor of a large congregation in south Sacramento. I hope this captures his friendliness and humor. Watercolor, 12.5 x 10.5 inches. 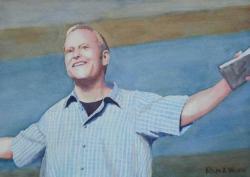 Watercolor: Pastor Greg - 20"x14"
Here's a portrait of the pastor at our church -- Rock Harbor Covenant Church in Rocklin, California. Watercolor, 20"x14". 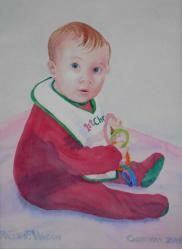 Watercolor: Evangeline, Christmas 2014 - 10.5" x 14.5"
This is a portrait of Evangeline at Christmas, a few days before she began to crawl in earnest. At the time she was about 5-1/2 months. I gave this to Jean on Mother's Day. Watercolor, 10.5" x 14". Watercolor: Granddaughter Reading - 10.5" x 14.5"
This is my granddaughter Evangeline at 10-1/2 months, on the balcony "reading." She is toddling around trying to act so grown up! Fun! Watercolor, 10.5" x 14.5" This painting was juried into the "Go with the Flow" 2015 WASH Open Show at the Sacramento Fine Arts Center, Sept 1-26, 2015. 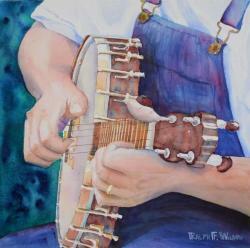 Watercolor: Bluegrass Banjo - 14" x 14"
There's so much energy in a bluegrass band. Here's a member of the Jumpsteady Boys plucking a banjo at the Father's Day California Bluegrass Festival at Grass Valley Fairgrounds on June 19, 2015. Watercolor, 14" x 14". This painting was juried into the "Go with the Flow" 2015 WASH Open Show at the Sacramento Fine Arts Center, Sept 1-26, 2015. 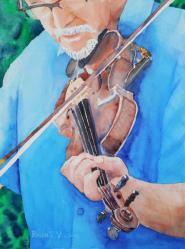 Watercolor: Bluegrass Fiddler - 10.5" x 14.5"
Here's a member of the Jumpsteady Boys demonstrating a song at the Father's Day California Bluegrass Festival at the Grass Valley Fairgrounds, June 19, 2015. Watercolor, 10.5" x 14.5". 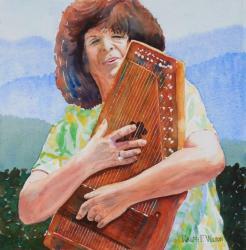 Watercolor: Bluegrass Autoharp - "14 x 14"
This was inspired by Judie Pagter who sang with her bluegrass autoharp at the California Bluegrass Festival in Grass Valley, June 19, 2015. 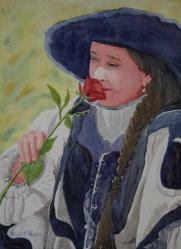 Pagter is a trooper who has sung mountain music all her life and has written many songs. She's also active with music in her Methodist church back in Virginia. 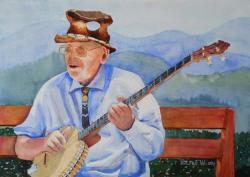 Watercolor, 14.5" x 14.5"
Watercolor: Bluegrass Long-Necked Banjo - 20" x 14"
I saw this character playing a long-necked banjo at the Father's Day California Bluegrass Festival at the Nevada City Fairgrounds, June 19, 2015. 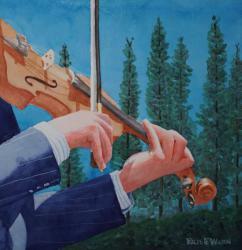 He is Carl Pagter, a founder of the California Bluegrass Association. 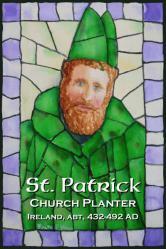 He sang with his former wife, Judie Pagter on the Pioneers Stage. He came with his funky leather top hat. I placed him with an Appalachian mountain background. Watercolor, 20" x 14". Watercolor: The Strong Arm of Liberty - 6.5" x 20"
Here's a view of the torch of the Statue of Liberty from almost directly underneath. 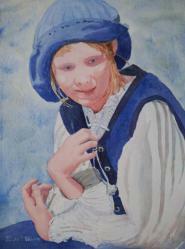 The painting uses only two colors: French Ultramarine Blue and Permanent Alizarin Crimson. Watercolor, 6.5" x 20". Watercolor: Angels Weep with Us, 20" x 14"
This is my interpretation of the often-replicated "Angel of Grief" (1894) gravestone sculpture in the Protestant Cemetery in Rome by William Wetmore Story. 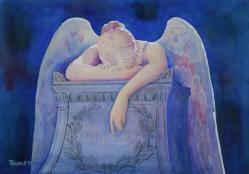 The gravestone, of course, is grey, but I wanted to capture the life of the angel in my painting. The monument is at the grave of the sculptor's long-time wife, Emelyn Story, who died in 1895 in Rome at the age of 74; he died later the same year. Watercolor, 20" x 14". 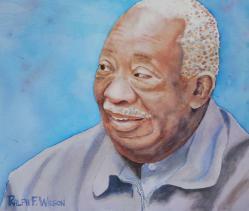 Watercolor: Willie, 14.5" x 10.5"
Our assignment was to paint using only the three primary colors, which could not be painted over one another to create complements, only grayed. 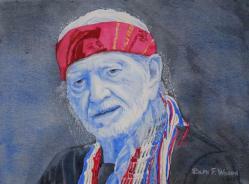 Here is Willie from a photo, wearing his trademark red sweatband. Watercolor, 14.5" x 10.5". Watercolor: Net Fishing in the Yuba - 14.5" x 14.5"
In August 2015, Bill Hersom and I were plein air painting near the old Rainbow Bridge where Hwy 49 cross the South Fork of the Yuba River. About the time we got ready to leave, families began to come to the swimming hole. 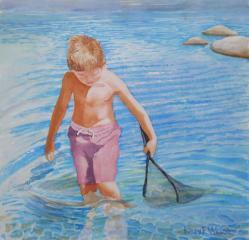 This young boy is looking for the tiny fish that swim these waters. Watercolor, 14.5" x 14.5". 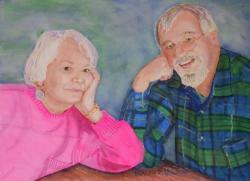 This is a portrait of my brother- and sister-in-law, from a photo taken in March 2011. 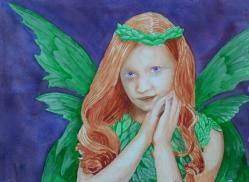 Watercolor, 14.5" x 10.5"
Watercolor: Wood Fairy - 14.5" x 10.5"
This is part of an assignment to paint only in secondary colors -- purple, green, and orange. My fairy's right eye looks sinister, but her left eye is friendly. Watercolor, 14.5" x 10.5". Watercolor: February Sun - 14.5" x 14.5"
While Jean and I were on our anniversary trip to Pt. Reyes in February 2016, we saw this guy, Greg, a traveler from place to place, who had his shirt off and was sunning himself, sitting crosslegged on a table in the small park in Pt. Reyes Station, CA during the noon hour. Beautiful body, but a cigarette? Watercolor, 14.5" x 14.5". Watercolor: Kenyan Pastor's Wife - 10.5" x 10.5"
Pastor Charles and I met this beautiful woman at the Transformation Center in Machacos, Kenya in 2014. She is the pastor's wife. This center is a mission project of First Baptist Church of Nevada City, CA, where Jean and I pastored 2012-2014. Watercolor, 10.5" x 10.5". 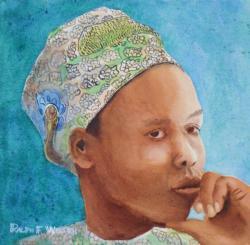 Watercolor: Green Turbaned Woman, Kenya - 10.5" x 10.5"
When Pastor Charles and I spoke at the African Renewal Pastors Conference in Eldoret, Kenya in 2011, this woman was in attendance. In Africa, going to church is a time to dress in your very finest. Watercolor, 10.5" x 10.5". Watercolor: He's Coming This Way - 20" x 14"
This painting comes from a photo of teenagers on a spit of rock at Drake's Bay beach at Pt. Reys National Seashore. 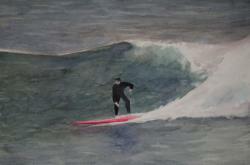 In the photo, the background contained breakers, but I tried to give it a different feel -- not altogether successfully. Watercolor, 20" x 14". 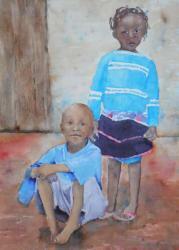 Watercolor: Slum Children, Kenya - 10.5" x 14.5"
On one of my trips to the Langas Estate slum near Eldoret, Kenya, I took a photo of some of the children. They are dressed with the cast off clothing of children from America and elsewhere. I love these very poor children and pray that their future might hold greater promise than their present surroundings. Watercolor, 10.5" x 14.5". 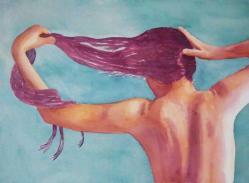 Watercolor: Hair to Spare - 14.5" x 10.5"
Our assignment was to paint a picture using a "triad," a technical term in color theory. My triad was yellow-orange, blue-green, and red-violet. I mixed each of the colors; none was straight from the tube. 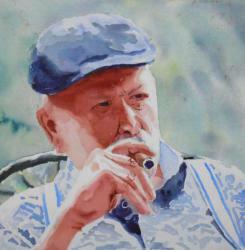 The subject is carefully cropped from a full-length figure (Aubrey) on Croquis Cafe (copyright free). 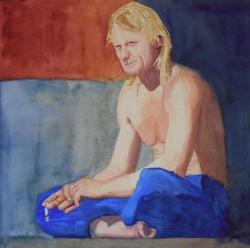 I especially enjoy the fluidity of the hair with the arms and hands. My teacher said it reminded her of a Maxfield Parrish figure -- which is a high compliment indeed. Watercolor, 14.5" x 10.5". 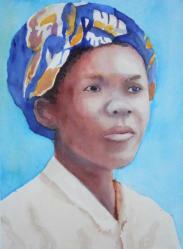 Watercolor: Turbaned Kenyan Woman - 10.5" x 14.5"
On my mission trip to Eldoret, Kenya in 2008, I videoed men and women dancing and worshipping. For this portrait I used a frame from the video in which she wasn't singing and dancing, but more reflective. Watercolor, 14.5" x 10.5". 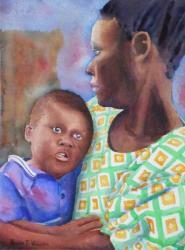 Watercolor: Kenyan Mother and Child - 10.5" x 14.5"
When I visited Eldoret, Kenya in 2014, I got a wonderful photo of a mother and child in a contemplative moment. What are they thinking? 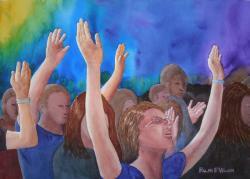 Watercolor, 10.5" x 14.5"
Watercolor: Hands Joined in Unity - 14.5" x 10.5"
In September 2008, I was invited to Eldoret, Kenya to lead a Reconciliation Conference in a city where nearly 500 people had been killed in tribal violence enflamed by political candidates for election. 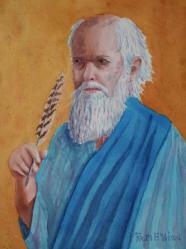 Pastors of the churches came from the tribes that had been killed and there was much distrust. I taught on forgiveness and love: "By this shall all people know that you are my disciples. Because you love one another." At the conclusion of the conference, Pastor Chriss Barasa Lusweti called representatives of the estranged tribes to line up across each other, join hands, confess to each other, and pray for each other. The work God did in that time was amazing to behold. 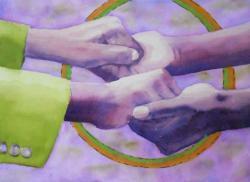 This painting depicts people from two warring tribes joining hands in unity. 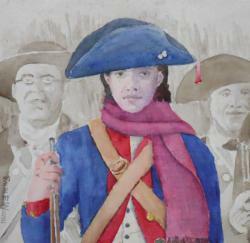 Watercolor, 14.5" x 10.5"
Watercolor: Let's Get Us Some Redcoats - 14.5" x 10.5"
I painted this on 4th of July, one of a series of 31 paintings in July 2017. My direct ancestor, Deliverance Parmenter (1744-1780) was a farmer in Sudbury, Middlesex Co., Massachusetts (about 8 miles southwest of Concord). According to the History of Marlborough (1881), "He was ploughing in the field near his house when the news reached him of the battle of Lexington and Concord [April 19, 1775]. He immediately unyoked his oxen, drove them into the yard, and with gun in hand started on the run to meet the British. He was at the battle of Bunker Hill, and remained in the service till October, when he returned home. The following spring, he again enlisted, and remained in the army three years." He took with him his teenage son Oliver (1762-1841), who didn't fight but guarded the wagons, so the story goes. 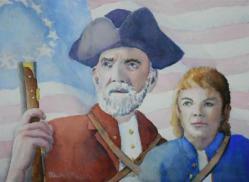 This painting memorializes Deliverance and Oliver Parmenter, revolutionary war patriots. Watercolor, 14.5" x 10.5". Watercolor: Sgt. Elijah Strong Hollister - 10.5" x 10.5"
In my series of American men of arms, I wanted to paint a revolutionary soldier on my wife's side of the family. Elijah Strong Hollister (1763-1813) served in the Revolution, enlisting at Manchester, VT, in Captain Stoddard at Lenox, Col. Joseph Vose's regiment (1780) and later in Col. Marimus Willett's New York Regiment (1781-1784). He was appointed a sergeant in this regiment, and was part of the time at Fort Plain in the Mohawk Valley. [The Hollister Family of America, Lieut. John Hollister of Wethersfield, Conn., and His Descendants, #4922] There's no way to know what his uniform looked like, but I dressed him up a bit, drawing on a photo of reenactors, a hand from another source, and a twenty-something face from Elijah's descendant Tom Gregg. Thank God for men and women who were willing to go through many privations in order to form our new nation on the American continent. Watercolor, 10.5" x 10.5". Watercolor: St. James the Lesser - 10.5" x 14.5"
I like the dramatic lighting on this wood statue of Staint James the Lesser on display at the Palace of the Legion of Honor museum in San Francisco. The statue is attributed to the style of Hans Backoffen (ca. 1500). 171019. Watercolor, 10.5" x 14.5". 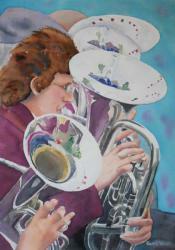 Watercolor: Four Euphoniums in the Band - 14" x 20"
In July 2009 Jean and I traveled to Chapel St. Leonards, a beach town in east Lincolnshire, to watch my sister-in-law Connie perform with a dance troupe at a town festival. The town's brass band was playing and I was fascinated by the four euphoniums in the band, with all the reflections of buildings, towers, and flags in their bells. (For those of you who don't know, the Euphonium is similar to the baritone popular in the USA.) Won "Painting of the Month for November 2018 at WASH. 171019. Watercolor, 14" x 20". 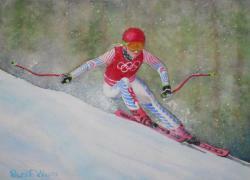 Watercolor: Women's Downhill Olympics 2018 - 14" x 10"
My assignment was to show snowing. Since the 2018 Winter Olympics just finished at PyeongChang, South Korea, I decided to depict the Women's Downhill, using a photo from a previous race for the figure, and clothing her with the 2018 USA uniform. American skier Lindsey Vonn won the Bronze Medal for the USA team in 2018. 180308. Watercolor with white gouache, 14" x 10". 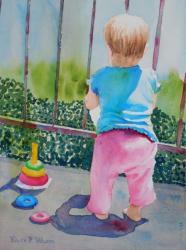 Watercolor: Forehand - 20" x 10"
My challenge was to paint an interesting cast shadow on the ground. This painting is cropped from a photo of a Japanese boy playing tennis on a clay surface. I wanted to crop it so the viewer would be forced to think about what was going on. I also love Daniel Smith's cobalt blue. And there are tennis courts painted just this color. Intense with the light orange of the legs -- a complementary color. 180417. 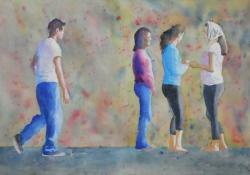 Watercolor, 20" x 10". 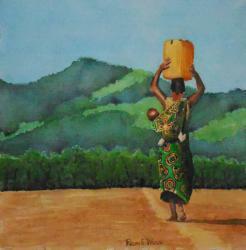 Watercolor: Carrying Water - 14" x 14"
This is a woman in Sinazongwe Zambia, who carries a baby on her back as well as a container of water. The inspiration for this came from our church's participation on May 19, 2018 in World Vision's 6K Race for Clean Water. Six kilometers (3.72 miles) is the average distance women have to travel to get water. After walking (most of) 6K, I began to appreciate the luxury of clean water in villages made possible through gifts to World Vision and other charitable agencies. 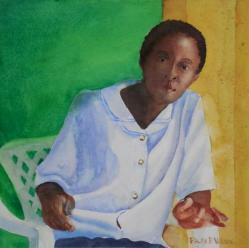 The painting is based on a photo iy World Vision photographer Jon Warren. Used by permission. 180616. Watercolor, 14" x 14". 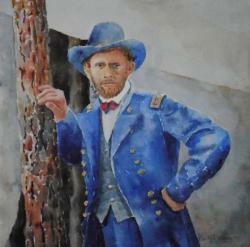 Watercolor: U.S. Grant at Cold Harbor - 14" x 14"
This watercolor is from a photo of Ulysses S. Grant outside his headquarters tent at Cold Harbor, Virginia, by a Union photographer Egbert Guy Fowx. A week before Grant had lost a lot of men in battle, but was determined to go on. I cropped a much larger picture to include Grant from the waist up because I liked the composition. And I enjoyed trying a looser style of portraiture. 180616. Watercolor, 14" x 14". In a private collection. 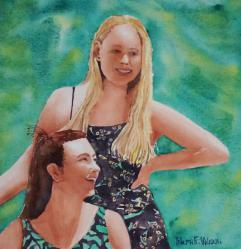 Watercolor: The Walker Sisters - 10" x 10"
Aeire Walker is a cellist; her sister Tuki plays the violin and sings vocals. At the 2018 Father's Day Bluegrass Festival at Grass Valley they were playing with the Crying Uncle Bluegrass Band. Here they are after their performance at the Vern's Stage, watching the next band perform. I liked this pose with the jutting elbow and the play of the overhead light on faces. One of the 31 paintings in the 31 days of July challenge that I painted during the 2018 World Watercolor Month. 180718. Watercolor, 10" x 10".